Peter Ashton Jones talks about the ideas that lie behind the paintings from his last solo show, The Eye of The Blackbird, which was inspired by a poem by the great American poet Wallace Stevens. It is likely that this talk could extend into a range of related issues to do with contemporary painting and its relation to history. Either way, this talk will be, fundamentally, about painting in the twenty-first century and questions are welcome. 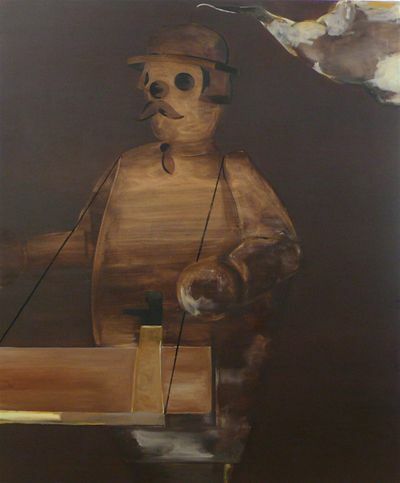 Like many painters Jones has had to support his practise with part-time work: Jones was the curator of The Nunnery Gallery from 2000-2004, Arts Director of Limehouse Arts Foundation from 2004 to 2006, and in 2007 he co-founded the painting magazine Turps Banana with Marcus Harvey. In 2012 he established and is currently a co-director of the Lion and Lamb Gallery. Alongside the above, Jones has curated numerous exhibitions in commercial and âproject' galleries in the UK and in Europe.